I understand that....but the work in question is only one of four compositions on the disc. So Sutermeister would be the youngest of that generation by far. 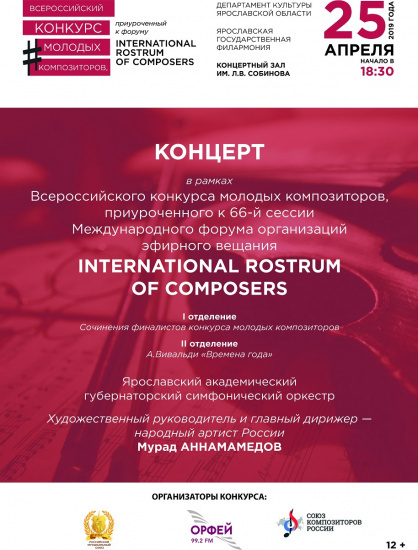 Tomorrow in Yaroslav will be held final concerto of Young Composers Competition .Conductor Murad Halmamedow will perform works by Yakov Alexandrov,Yekaterina Buzovkina and Anna Natevina, performed by Yaroslav Symphony Orchestra. Vegemite tastes very much more salty than Marmite, to me - not something I can cite in its favour. On the other hand, one can simply spread it thinner? Problem solved! That's tough! I hope you'll be able to buy it again,at some point in the near future?! As to me?! I think I just,thought,I liked Vegemite,for a while;because my (late) mother,had bought some. I bought it for a while,convincing myself that I liked it better than Marmite. Then Morrisons (the supermarket I was going to,at the time) stopped stocking it,and I had to eat Marmite again;having tried the Morrison brand,and not liked it. Eating Marmite again,made me realise how inferior Vegemite was!! I notice that the slogan on the Vegemite website is,"Tastes like Australia". Well,good for them,if they really do love it?! Yet,I was reading,somewhere,that Vegemite was actually,invented,as a substitute for Marmite,because German U boats prevented Australian's from getting supplies of their,much loved,spread,during World War One! On the other hand,the Vegemite site says that wartime rationing (of Vegemite) during World War Two,meant that Vegemite was in short supply there;and it was the,subsequent,craving,of Australian's,for the home 'grown' product,that led to it's dominance (after the war)! I can't see anything about U boats,there!! Most of Sutermeister's music is choral but there are three piano concertos, two cello concertos and a clarinet concerto. I do hope that "Volume 1" does actually mean that there will be further instalments! Sometimes in the past this has not always been the case. Now...what about some Willy Burkhard and Conrad Beck. I admit to being a life-long Marmite fan. However, now that it is owned by Unilever, it comes under the list of EU-produced items which are banned from import into Russia. There could be some hope from Brexit - if Britain is no longer an EU nation, then Marmite - made, I believe, in the UK, but 'owned' by Unilever in the EU - ought to come off the list of goods which Russians may not purchase (or even arrange to have delivered). Of course, other goodies (such as marmalade, and the huge range of UK-produced cheeses) would also come off the banned list. Meantime, Vegemite - produced outside the EU, in Australia - remains avalable here in Moscow, and I am reduced to having to eat it - while the 'real thing' is not on sale. Being a lifelong vegetarian,, Marmite is not only a tasty toast topping, but also an essential part of my diet (Vitamin B12 - no naturally-occurring vegetarian food sources for it). Of course, it was this viatmin component that lay behind the product's original introduction, I believe? Hopefully Sunday's departure of the UK's darling Presiident Porkyshenko in Kiev will see the EU blockade of Crimea lifted quite shortly - and with it, Russia's 'mirror' ban on EU products. Welcome news for people living in Lugansk and Donetsk, too!! I seem to remember there was some short lived,controversy,some years ago;when a school tried to ban Marmite,because of,what was perceived as,a high salt level! Now,I don't know whether there is any truth in that? When I was a child,I remember being told that,there was yeast in Marmite;which,apparently,meant it was good for you! Anyway,I believe the school quickly backed down,after a furious backlash from angry Marmite lovers;and one of their favourite foods was quickly reinstated! Marmite also made national headlines,more recently;when there was a dispute between Tesco and Unilever;who had hiked up the price of some of their products. Marmite being one of them. I remember listening to a news bulletin,informing me that some worried consumers had been stockpiling jars in lieu of a Marmite crisis;which was referred to,rather unimaginatively (I thought) as Marmitegate! This between items on the Middle East and people dying!! Didn't it occur to any of these people,that there are other stores,besides Tesco?!! I must admit,I did get a little worried,myself;as I love the stuff! It's also very economical;despite the initial outlay,because it has such a strong taste that a little goes a very long way! Which is good news for paupers,like me! I remember staying with my father,recently,and finding to my horror that he'd stocked up with a supermarket brand,instead of the bone-fide product! I had to explain to him that Marmite is not like any old product. It's a 'concoction';and you can't just imitate it! Marmite has a very distinctive taste! I did try eating the Tesco brand,for a while. It was runnier and saltier;but I kept telling myself that it wasn't that bad,and I was probably saving myself some money,since it was cheaper!! Imagine my delight,when I discovered that,despite the fact that the Tesco jar looked the same size,it actually had less Marmite inside it!! Finally,I had a good reason to eat the more expensive,branded product! !